The Rock På Torget mini-festival offered a bonanza for anybody remotely interested in Norwegian rock history. Four of the nation's greatest rock bands from the 70's playing on the same stage on the same night, almost too good to be true! Such a unique happening was bound to create great expectations, and I am happy to say that all were fulfilled. We could have wished for better weather, instead it got increasingly dismal through the night. 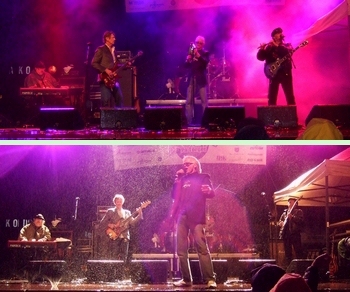 The rain, the wind and the low summer temperature must have been difficult playing conditions for the musicians, the stage was at some point soaking wet. But for the audience (and also for the bands it seemed) this was whisked away by the ecstatic feeling of enjoying (and presenting) a once-in-a-lifetime musical smorgasbord. So let's see what Høst, Ruphus, Junipher Greene and Aunt Mary dished up this evening! 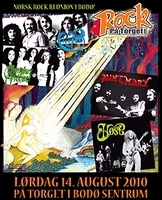 First out were Høst (Mk 1), with all original members from the 1974 debut På Sterke Vinger, an album chock-full of twin-lead guitar driven melodic rock. The (Norwegian) lyrics were kind of naive, as were the melodies, the vocals slightly theatrical, but a highly enjoyable album anyway, especially for those who like the more epic bits of the early Wishbone Ash albums. However, this night's impressive performance made me view the album in a new light, placing it high on my list of favourite Norwegian rock albums, where it belongs. Much thanks to vocalist Geir Jahren, who turned out to be this evening's most memorable stage personality. I have never seen the band live before, so this was a real eye-opener, his voice was as strong as ever, and the theatrical vocal bends fitted hand-in-glove with his playful, gesticulating and communicative stage persona. They played most of the På Sterke Vinger straight through, the guitar playing from Svein Rønning and Lasse Nilsen was impeccable, and when the fabulous title track ended I'm sure I wasn't the only one who was sad it was already over! Junipher Greene is responsible for the Norwegian milestone 70's debut double album Friendship, an album so good it's still regarded as one of Norway's best rock albums, containing strong song-writing throughout. It's a classic prog-psych-hippie effort, standing up to anything in the genre. The album was newly remastered and reissued on CD for new (and old) generations to enjoy, and the band have successfully played the album from beginning to end at concerts these last years. Reports have been very positive, so although time didn't permit giving us the whole of Friendship, we got the best of it. 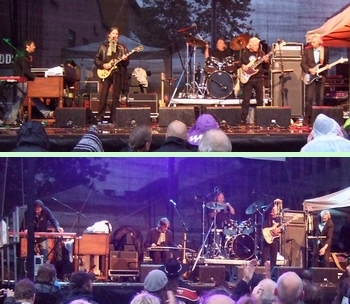 The line-up was the original one from Friendship, but Jon-Willy Rydningen stood in for keyboard player Helge Grøslie who couldn't attend due to illness. The band seemed to enjoy themselves as much as the audience, the guitar duelling between Freddy Dahl and Bent Aaserud sparkled (Dahl even did the Hendrix-style gimmick of playing with his teeth! ), the singing was superb, in fact this is still such a good band that I am sure they could go on a successful Friendship tour today! Aunt Mary made three memorable 70's albums: their self-titled 1970 hippie-rock debut, 1972's heavier and more guitar based Loaded, and Janus from 1973, where they went more melodic, sophisticated and psychedelic. 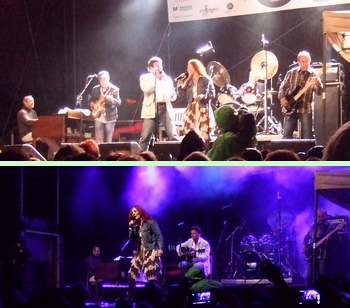 Vocalist Jan Groth quit before Loaded, but after the release of two classic singles: "Jimi, Janis And Brian" (a lyrical re-write of Marvin Gaye's "Abraham, Martin And John"), backed with "Stop Your Wishful Thinking", and "Rosalind", which had a version of Edvard Grieg's "In The Hall Of The Mountain King" on the b-side. In Bodø all key members were present: Bjørn Kristiansen (guitar), Svein Gundersen (bass) and Ketil Stensvik (drums) alongside Groth. Compared to Junipher Greene, Aunt Mary was louder and heavier, not surprising, since they focused on the material from Loaded. This album, arguably their key album (Janus is also good, but perhaps more of a studio creation), suffered from a wimpy drum sound, and is productionwise two steps behind their other releases, but this night a track like "Joinin' The Crowd" really got the treatment, raw and dirty, almost gritty, making it seem darker than on the album. Of course, with Groth present, they had to play the singles mentioned earlier, and they did all four songs from them. I am sure "Jimi, Janis And Brian" was a highlight for many in the audience, but their rendition of "In The Hall Of The Mountain King" really smoked. Also superb was their inclusion of "Listen To The Music", a song which recently resurfaced from Swedish radio archives. Released last year as the album "Barbed Wire Waves", it contains four tracks recorded in 1971, live in the studio. A highly recommended release! The band reportedly didn't remember ever playing "Listen To The Music", but luckily they decided it was so good that they rehearsed it into their present live set. A definitive highlight of the evening, not only for historical reasons. Fun also to hear the insertion of the "Whole Lotta Love" riff into their ending "G Flat Road", another killer track from Loaded. Kristiansen was apparently headed for more detours during that song, but sadly it looked like Groth was instructed to cut their set short. Maybe I misunderstood, but Groth got a message from behind the stage, looked pissed, passed a message to Kristiansen, who seemed to cut his impro part short. Anyway, Aunt Mary really delivered this night. Ruphus debuted in 1973 with their classic prog rock album New Born Day, also their most rocking effort. 1974's following Ranshart was blander, like a light version of Yes. After that they headed for jazz-rock, and finally fusion. All while constantly shifting members. For more information on this history, visit our report from the event earlier this year where all different line-ups gathered for a night of Ruphus celebration. I didn't know which line-up of Ruphus would show up this night in Bodø, so it was slightly disappointing to learn that it was mostly the one from the 1979 album Manmade, in addition to vocalist Rune Sundby. Still, both Sundby and the other vocalist, Gudny Aspaas, along with guitarist Kjell Larsen, also played on their 1973 debut. It would have been nice to see Håkon Graf though, their keyboardist extraordinaire through the early albums. Anyway, tonight's Ruphus line-up played a fine set this evening, also picking favourites from the first two albums. At times their performance seemed to lack something, I was hoping for more instrumental excitement, but for large parts it was the two vocalists who got the attention, bot visually and musically. However, Gudny Aspaas' voice is still very powerful, and listening to her singing the magnificient ballad of "Trapped in a Game" from New Born Day was another of this night's definitive highlights. Ending it all were Høst (Mk 2). 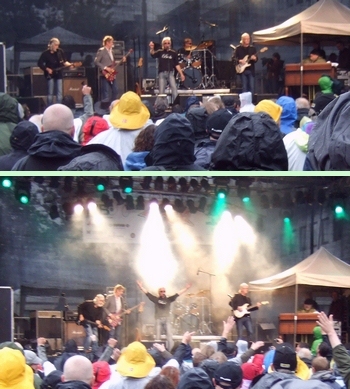 After their 1974 debut album, only vocalist Jahren and bass player Bernt Bodahl remained in the band, while the two guitarists were replaced by guitar wizard Fezza Ellingsen, the now legendary hard rock drummer Willy Bendiksen, and Halvdan Nedrejord on keyboards. 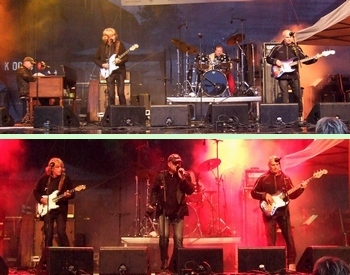 Musically Ellingsen took the lead, writing most of the new material for their 1976 album Hardt Mot Hardt, and directing the band towards more advanced progressive rock, with odd time signatures and more "difficult" melodies. A key element was Bendiksen precise and dynamic drumming and of course Ellingsen's guitar. The lyrics were also more puzzling. However, you win some, you lose some - I'm sure many remember the more immediate debut album with more fondness. Still, Hardt Mot Hardt contains several memorable tracks, and although it's a more challenging listen, it is arguably more interesting in the long run, compared to their debut album, especially if you're more into the technical side of prog rock. This second line-up of Høst had not gathered on stage since the late 70's, so it was undeniably one of the night's historical events. Ignoring the by now extreme wetness on the stage, the band launced into the opening track "Profeters Ord" and never looked back. Jahren continued to impress, again coming through as a first class entertainer in addition to singing like the album hit the streets yesterday. It was hard for me to tell if Ellingsen's guitar solos sometimes slipped over into chaos, but he seemed to have no problems reproducing his own challenging excursions from Hardt Mot Hardt. And of course we also got the obligatory hard rock drum solo from Bendiksen. In his singlet and with his own cooling fan (as if that was needed this night), he only stopped short of smelling his own arm pits. Otherwise they played the whole album through, and the audience seemed ecstatic. There was no denying that Høst (Mk 2) could leave town triumphantly! To sum it up: It was a great evening, and although I wouldn't have minded if the band order had been switched upside down, most bands did most impressive sets and all was well worth hearing. I am sure every one in the 1.300+ audience will have their own favourite moments to remember, and I would be surprised if anybody left unsatisfied. I'm just happy nobody got electricuted on stage from all the rain! According to the arrangers, there is hope for a new 70's celebration next year, and already there are talks of getting Popol Vuh/Ace and Prudence to perform. Wow! Well, if they could get Saft also, we would get totally spoiled! For a superb and thorough report from this event, please visit Rocksirkus.com. It's in Norwegian, but they also have a lot of pictures. Visit the Rock På Torget website for more information on this year's (and hopefully next year's!) concerts (also in Norwegian). You may also want to check out our Ruphus article/review: Rockefeller, Oslo, 12.02.2010.